When Torquay won the Conference Premier play-off final in 2009, few at Plainmoor thought they would head back out of the Football League just five years later. A new board, backed by £15m lottery-winning supporter Paul Bristow, took control of the club in the summer of 2007, with a new manager and a new squad. The Gulls had endured a chaotic final League season, with five men occupying the dugout from the January 2006 until their eventual demise in May 2007. But promotion followed two years later and, despite Bristow his wife Thea took on the legacy. However, after an appearance in the and 12 months later, it seemed history was beginning to repeat itself. The Gulls brought in the experienced Alan Knill to after weeks of uncertainty had seen Torquay go from mid-table security to relegation fodder. While Bristow is still chairman, there is as there was when her family's numbers first came up. This season Torquay have had 14 different players join on loan, while three free agents arrived well after the season had begun. "The people you bring to the club are important and they have to know what entails playing for Torquay," said Buckle. "I used to say that if I got the right vibe, that they were really on board with this, then I'd go with it, if not I'm not interested. "I wouldn't allow anyone to come to the club unless I was really sure they were right." And Branston believes there are not enough players in the current side with the correct mentality. "It's important that the lads have got to be here for the right reasons," he said. "I know a lot of Alan Knill's lads were brought in on good contracts and he brought in a lot of loan players, but I think for a club like Torquay, you've got to make sure you've got the right players. Signing them from the pre-season onwards is big for a club like Torquay. "Plus you've got to be looking to produce your own players that have the right mentality for what the club stands for and what it's all about. "It's having that togetherness as a group, and if you're constantly bringing in loan players it disrupts that core." "I didn't think it was significant at the time," said Breed. "But in hindsight it clearly was, because we were doing OK up until when Martin went off sick. "With Alan Knill coming in at the back end of that season, he said he saved us, and ultimately he picked the team that kept us in the League, but only in that last game. "I think it was a major problem when Martin went off and maybe not a lot of thought had gone into moving Martin and bringing in Knill at the time. "Martin's said he'd have liked to have come back and perhaps that wouldn't have been a bad idea in hindsight." But Branston, who left Torquay in the summer that Ling took over, says the managerial change was justified: "Unfortunately for Ling he lost his job because the team wasn't winning football matches. "Yes his illness took over and we now know more about it, but they were still losing football matches. "The players shouldn't be affected by what's going on off the pitch, they should deal with it and carry on that mentality that Martin Ling had carried over from Paul Buckle." Torquay's top scorer is winger Jordan Chappell with five goals, the last of which was scored on 26 October. Joint-second are centre-backs Aaron Downes and Krystian Pearce, with four apiece. The club has used 13 different recognised strikers, either on loan or as permanent signings, with the best return being just three goals. "I think people will quickly say Torquay's biggest problem was not scoring enough goals, but I think you have to look deeper," said Branston. "You have to look at the mentality of the players that have been brought in, the ethos of the club. "The team have had a lot of 1-0 defeats, which shows to me that you can't score goals and you can't see out games. "The mentality of a player has to be that if the forwards aren't doing it, then the defenders should be doing it." But Breed disagrees and says Knill's decision to sign players like Karl Hawley and loanee Callum Ball just before the start of the season had a big effect. "Our recruitment last summer was poor under Alan Knill, he recruited players on two-year contracts that have done nothing for us. "Hawley and Ball came in a couple of days before the first league game and straight away started the opening game against Wimbledon and just didn't do it for us. "The situation was allowed to continue until we got a forward in like John Marquis, who did OK for us. "But Elliot Benyon simply hasn't scored enough goals and they have had the chances, they have had the supply line." Can Torquay return to the Football League? "It is difficult, but it'll be made easier that Luton are out of it now," says Buckle, who as well as guiding Torquay to promotion from the Conference, also managed Luton last season. "You don't want too many clubs in there on big money who are trying to buy their way out, so to speak. "But I don't think it's as strong as it has been and I'm hopeful that they can recreate what we did and get back. 2009: Luton Town - promoted to League Two in 2014. Chester City - Relegated from Conference in 2014. "Torquay are a Football League club, we've proved that, but we've got to get the right people in. Chris Hargreaves knows that." Branston feels it is important that the club can get rid of the players who do not want to be at the club, and bring in experienced winners. "You have to change quickly. As soon as the pre-season starts you wipe the slate clean, you get out the core element of the problem, whatever that may be. "You bring people in who've won the Conference and played in the Conference who have the right mentality to take clubs forward and you breed players off that. 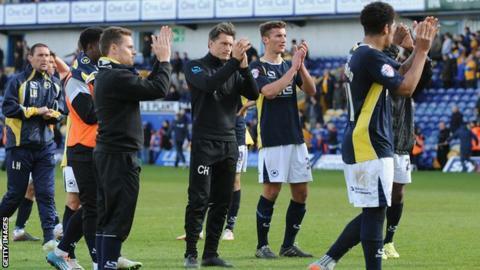 "You produce you own players who have got the ethos of Torquay United in their veins from when they're 15, 16 or 17 years-old. Where are those players? Why haven't we seen those players for three or four years?" But Breed is not so sure: "When we went down last time, that summer we recruited Paul Buckle, we had a new manager, we had almost a complete new team and we had a new board of directors. "There was a real feel-good factor, we played Grays Athletic in our first home game and there were 4,500 people here and everything seemed really new. "Now we're going down again and the manager we've got here I feel is struggling very badly, there's no new board of directors and finances are an issue. "You lose a lot of money coming down. "I'll be very surprised if Torquay ever become a League club again. I hope I'm wrong and I don't wish to be defeatist, but unless an investor comes in and buys the club or invests heavily, Torquay are going to be a Conference and below side from now on."